Do you think a word of commentary is necessary–or is our elation for the surviving children of Gaza quite enough? Did we just go through hell over their fate only to see the little rascals playing games where they could break their necks? 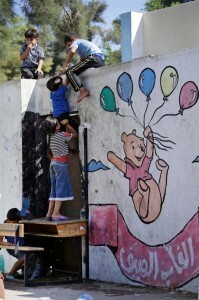 These little ones are playing in the courtyard of a school the UN uses as a refugee center in Gaza City. They’ve been through hell & it’s only just begun but with the immense international solidarity movement now standing with them, they will grow to be the future of a free Palestine. Previous PostThe mass psychology of ethnic cleansingNext PostThe world you save will be your own.